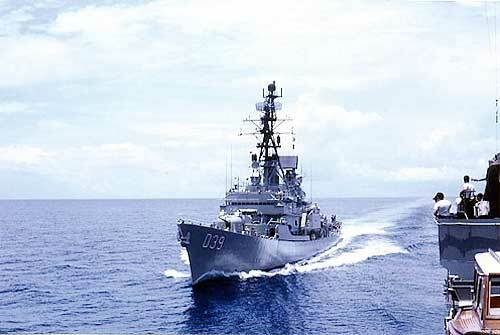 Commanded by Captain G. R. Griffiths DSC, HMAS Hobart, the first Australian destroyer to be sent to Vietnam, left Sydney on March 7, 1967 for attachment to the US Seventh Fleet. Hobart joined the Seventh Fleet at Subic Bay Naval Base on the 15th, and the next day received on board COMSEVENTHFLT, Vice Admiral J. J. Hyland USN, who had flown from Yokosuka, home port of the Seventh Fleet, to welcome the ship. After anti-submarine warfare (ASW) exercises and gunnery practice near Subic Bay, Hobart left for her Vietnam NGFS station relieving USS Fechteler (DD 870) off Cap Mia, Quang Ngai province, southern I Corps on March 31. Hobart's task was to provide NGFS for US Marines and ARVN forces in southern Quang Ngai province, ninety miles south of Da Nang, in Quang Nam province, the major port of the Central Lowlands. It was at Da Nang that the US Marines in March 1965 made their first amphibious landing in Vietnam. Their numbers quickly increased until by late 1966 there were 60,000 marines in Vietnam, mainly in I Corps. Units of the 1st Marine Division came ashore near Chu Lai, a coastal city in Quang Tin province, in August 1966. This division assumed responsibility for operations in Quang Tin and Quang Ngai provinces, while the 3rd Marine Division in northern Quang Tri province guarded the southern border of the DMZ against NVA incursion. The 3rd Division shared its operational area with the 1st ARVN Division. With the 5th Marine Division and supporting logistic and aircraft groups, the two divisions formed the III Marine Amphibious Force whose commanding general exercised the US field command for I Corps. From mid-1966, enemy activity and marine combat operations were at their most intense in the northern area of I Corps, and this pattern continued during March and April 1967 when numerous small unit encounters near the DMZ between Marine units and elements of NVA 324 B Division developed into a major NVA attack on the Marines at Khe Sanh on April 24. The southern elements of the 1st Marine Division in Quang Ngai province (operationally known as Task Force X-Ray), were based at Chu Lai. Also near Chu Lai was the 2nd ROK Marine Brigade (the Blue Dragon Brigade). The 2nd ARVN Division was established 20 miles south at Quang Ngai City on the fertile coastal plain, and had the same zone of operations as the 1st Marine Division. Quang Ngai, a fishing port with lighterage facilities for large cargo ships, was an important military base from which operations were mounted to keep land routes from the coast to the central highlands free from Viet Cong control. Twenty-five miles further south, a Marine battalion, replaced early in April by a brigade of the US Army 1st Air Cavalry Division, was established in the village of Duc Pho. Providing NGFS for this battalion was Hobart's primary task. Hobart's secondary task was support of the 2nd ARVN Division which was responsible for the area between Quang Ngai and Duc Pho. This part of Quang Ngai Province was a strongly-held Viet Cong area with considerable infiltration of arms and supplies from the sea in spite of Market Time patrols. Hobart fired her first rounds on the morning of March 31 against a Viet Cong assembly point, carrying out her first H & I mission that night on a number of targets to interrupt Viet Cong movement. Early on the morning of April 1, Hobart responded to an urgent call for assistance from a Marine patrol outflanked by Viet Cong. Her star shells provided illumination which assisted the patrol to extricate itself from the entanglement with the enemy. By 0445 that morning, Hobart had fired her 100th round. That evening, the ship carried out her first night UNREP from the ammunition carrier USS Rainier (AE 5). Some days later, Hobart's routine of nightly H & I firings was varied by a middle watch call for assistance from a 2nd ARVN Division observation post ten miles north of Cap Mia. Fifteen of the Viet Cong attacking the post were killed by Hobart's gunfire. Hobart's 1000th round was fired on April 10, during operations in which elements of the US 1st Air Cavalry clashed with Viet Cong units on the coast near Duc Pho. Hobart's sick berth staff carried out their first MEDCAP on the 11th when a young Vietnamese boy, injured in a junk accident, was transferred from a Market Time patrol craft and given treatment on board Hobart before he was taken to Quang Ngai by MEDEVAC helicopter. Early in the morning of April 15, Hobart fired HE rounds onto Viet Cong who were directing fire into 2nd ARVN Division positions. Later the same day, she left I Corps to join Sea Dragon Operations. The period on the gunline, short as it was, gave much opportunity for high speed manoeuvring and long-range bombardment was a useful introduction to Sea Dragon. HMAS HOBART on Yankee Station - Vietnam. Hobart joined the northern Sea Drag Unit (TU 77.1.1) on April 16 relieving destroyer USS Turner (DD 951). 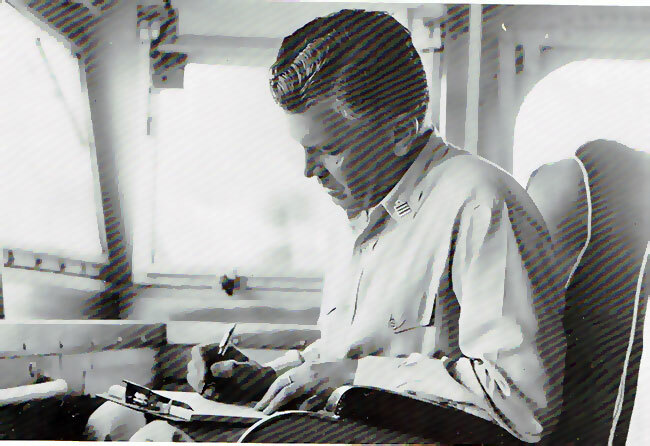 The Commanding officer of the heavy cruiser USS Boston (CA69) was the overall Sea Dragon commander of (CTU 77.1.0) The huge numbers of WBLCs observe the 1967 Tet ceasefire (February 8 to 13) emphasised that North Vietnam had planned to use the ceasefire period to ship a large volume of supplies south to be unloaded in the river mouths north of the DMZ and transferred to trucks for transport inland along the Ho Chi Minh Trail. As a result of this massive buildup of arms and supplies, the US Joint Chiefs of Staff authorised expansion of Sea Dragon operations, and by late February the task group was allowed to attack inland military targets as well as firing on coastal radar and artillery sites. Sea Dragon operations increased in tempo in March as task units came more often under increasingly accurate coastal defence fire and a minimum of four destroyers was made available for the task group. In company with the destroyer USS Duncan (DDR 774), soon relieved by USS Collett (DD 730), Hobart arrived off the town of Quan Tay about 15 miles north of the DMZ on April 17, and fired on the Xom Viñh transhipment point, the Quan Tay Tri truck park and a petroleum store. While Hobart bombarded the targets, Duncan fired on coastal defence artillery sites. With this mission completed, the ships cruised north conducting a night sweep for WBLCs. Though hindered by the poor weather brought by the north-east monsoon, the task unit successfully bombarded the Quang Khe ferry complex on the afternoon of the April 18. Two check points near Phu Chanh on Highway 1A, the old 'Mandarin Route' from Hanoi to Saigon, received eighty-eight rounds from the task unit the next day. Hobart first came under fire on April 21 soon after having successfully shelled barges in a river mouth north of Cap Falaise. As the task unit—by then including the USS Ault (DD 698)—withdrew, it received fire from coastal defence batteries. The first enemy rounds straddled Hobart, while three following rounds hit the sea less than fifty yards from the ship. The ships continued their withdrawal directing counterbattery fire at the enemy artillery. Three small pieces of shrapnel were later found on Hobart's upper deck. Hobart and Collett came under fire the following day while preparing to attack targets near the town of Thanh Hoa, a provincial capital and important centre of cotton production and mineral extraction situated ten miles inland from the mouth of the Song Ma River. While Collett was detailed to fire at the targets, Hobart was to'ride The Vinh Ang military area near Ki-Anh, inland from Mui Ron, was bombarded in the afternoon of May 15. The task unit then returned forty miles south to make an early morning attack on truck convoys nearing the Song Dun river highway bridge. As the two convoys neared the bridge, the ships opened fire, Hobart ranging along the roads leading to the bridge, while Sumner aimed at the bridge itself. At daylight, a US Air Force reconnaissance aircraft was able to identify at least ten trucks destroyed before intense anti-aircraft fire forced it to leave the area. On May 17, an attack on the Truc Li ferry complex south of Dong Hoi drew the fire of fifteen coastal defence batteries onto the task unit. About 130 rounds were fired at Hobart which was repeatedly straddled. Thirty-five rounds landed within fifty yards, with the closest round ten feet from the port bow. As the task unit withdrew, Hobart delivered sixty-seven rounds of counter-battery fire, destroying three of the coastal defence positions and setting an ammunition dump on fire. On completion of this mission, the task unit was sent to northern I Corps, immediately south of the DMZ, to provide extra NFGS for Operation Beau Charger which was part of the first allied incursion into the southern half of the DMZ. This thrust was carried out in a series of operations in late May. The US Marine operations Hickory, Beau Charger and Belt Tight, with the ARVN operation Lam Son 54, had as their main objective the destruction of enemy bases from which attacks were being launched on Marine outposts along the southern boundary of the DMZ. A secondary objective was the evacuation of Vietnamese civilians and their resettlement further south in pacified areas of Quang Tri province. In Operation Beau Charger, ARVN infantry and airborne troops swept into the DMZ with a Seventh Fleet Marine Special Landing Force amphibious and helicopter-borne assault just south of the Demarcation Line. As North Vietnamese batteries on Cap Lay, a conspicuous headland just north of the Demarcation Line, were close to operational area, the NGFS force for the operation was augmented by the heavy cruisers USS Boston (CA69), USS St Paul (CA 73) and five Sea Dragon destroyers. Hobart and Sumner fired on shore targets the west and south of Cap Lay and silenced from the Cap Lay batteries. As it was expected that the Buddha's birth truce on May 23 would be used by the North Vietnamese to replenish supply dumps and position troops, the Sea Dragon task units which increased from two to four to give more intense surveillance of coastal areas. Captain Griffiths took command of Task Unit 77.1.1, Hobart and USS Fechteler, marking the first time since the Korean War that a RAN officer had assumed tactical command of US warships on active service. The placing of Fechteler under the tactical command of an RAN officer emphasised the total integration of RAN ships with the Seventh Fleet. Hobart and Fechteler proceeded north to patrol from Cape Falaise south through the Bay of Brandon, steaming along a coast very similar to the Kien Giang region. The two ships came under fire in the early hours of May 24 while moving south through the 'Slot' in the Bay of Brandon firing on shore targets. The 'Slot' was an area of supposedly safe water which was believed to be outside the maximum range of enemy batteries on Cap Falaise to the north, the shore of the bay to the west and the islands of Hon Matt and Hon Nieu to the south. The closest enemy round appeared to fall about 3000 yards from Hobart. This was the fifth time Hobart had come under fire. That afternoon, Hobart and Fechteler were fired on again in the same area. The closest rounds fell about 600 yards from Fechteler and 2000 yards from Hobart. Hobart left Sea Dragon on May 26 being relieved by USS Benjamin Stoddert (DD 922). At Subic Bay, re-barrelling of both mounts was completed and Hobart sailed for a recreational visit to Keelung, Taiwan. Hobart returned to the gunline on June 18 assigned both to Task Unit 70.8.9 for NGFS in I Corps, and to Task Group 76.5, the Seventh Fleet Amphibious Ready Group for Operation Beacon Torch. With USS Harry E Hubbard (DD 748), Hobart formed Task Unit 76.5.1. Captain Griffiths took command of this task unit which provided both a destroyer screen for the amphibious warfare ships headed by the amphibious assault ship USS Tripoli (LPH 10), and NGFS for the marine units ashore. Beacon Torch was a search and destroy operation mounted by the Amphibious Ready Group and its embarked Special Landing Force (a Marine infantry Battalion with supporting artillery and engineers) to clear the coastal areas and Quang Tin provinces south Viet Cong and NVA units. While the Special Landing Force went ashore eighteen miles South of Da Nang, two flanking operations code named Brown and Adair were in progress driving the enemy into the landing force's operations. From the northwest, the 2nd Battalion 1st Marine Regiment, pushed south (Brown) while the 1st and 3rd Battalions 5th Marine Regiment, came north (Operation Adair). Hobart was assigned to support Operation Brown as the 2nd Battalion, 1st' Marine Regiment, was deployed some distance inland, and Hobart's 5 inch guns could bombard Viet Cong positions inaccessible to Marine artillery. Beacon Torch and its supporting operations lasted until mid-July. Hobart left I Corps on June 23 to relieve USS Theodore E Chandler (DD 717) in the southern Sea Dragon area. Hobart joined USS Edson (DD 946) in patrolling from Cap Lay north to Mui Ron. Major targets were highway bridges and causeways near the Song Giang river 'mouth. A concentration of WBLCs were detected south of Mui Ron by spotter aircraft on June 24 and attacked by the task unit. Six WBLCs were destroyed and two damaged, with nearby coastal defence sites also being bombarded. The next day Hobart and Edson proceeded north to the Bay of Brandon as Task Unit 77.1.1. Stoddert and USS Samuel N Moore (DD 747) relieved them in the southern Sea Dragon area. Hobart and Edson bombarded the Tan Loi ammunition store inland from Cap St Anne, and ranged from Cap Falaise south to Mui Sot, firing on coastal defence sites. From Cap St Anne, southern extremity of the Bay of Brandon, to Mui Ong, the coastal plain is similar in topography to that which extends from Mui Ong south past the DMZ to Da Nang. However, the northern plain is wider, with scattered outliers of the Annamite Chain rising to more than 2000 feet. Mui Ong itself marks the end of the spur of the Annamite Chain which partially separates the two plains. The northern plain, like the southern, is very fertile, scattered with numerous villages, and extensively cultivated in rice. The dune-fringed coast has numerous lagoons and estuaries, the largest of which are the Cua Hoi (the mouth of the Song Ha River), the Cua Sot (a major transhipment area), the Cua Nhuong and the Cua Khau. These provide anchorages for fishing vessels and access to the sea for the main towns of the region. Sea Dragon ships destroyed thirty-eight coastal defence sites, and destroyed or damaged more than 160 WBLCs in June. After a successful firing by Hobart and Edson on a petroleum products store northwest of the mouth of the Kien Giang River on July 6, a group of WBLCs were sighted at the river mouth. Two were destroyed and four damaged in twenty-six minutes of firing by Hobart. Late that night, a large truck convoy was detected by a reconnaissance aircraft north of the Chan Hoa highway bridge outside Dong Hoi. Bombardment of the convoy slowed the traffic for attack by the 7th Air Force. Hobart left Sea Dragon for Hong Kong on July 10 to give the ship's company recreational leave and followed this with a three day self-maintenance period in Subic Bay. When Hobart returned to the Gulf of Tonkin, she was assigned both to Task Group 77.6 in the destroyer screen of the attack carrier USS Forrestal (CVA 60) and to Task Unit 77.1.2 for southern Sea Dragon operations. This dual responsibility meant that Hobart was detached from Forrestal's screen for Sea Dragon but could be recalled to the carrier if required. On July 24, Captain Griffiths assumed command of Task Unit 77.1.2 and with Chandler patrolled south of Mui Ong past the mouths of the Song Giang and Kien Giang Rivers. In the next four days, targets successfully bombarded included the Chu Mac truck park, the Nhi Thuyen highway ferry and several WBLCs. At 1053 on July 29, a serious fire broke out among aircraft on the flight deck of Forrestal which at this time was ninety-five miles north of the task unit. Hobart received news of the fire a few minutes later while the routine logistic helicopter from Forrestal was with the task unit transferring mail. Hobart's medical officer, Surgeon Lieutenant L. Barnett was sent immediately to Forrestal in the helicopter and was probably the first outside medical assistance to reach the burning carrier. Forrestal withdrew from the Gulf of Tonkin and Hobart and Chandler soon joined her sending across firefighting equipment and medical supplies by helicopter. Early the next morning, Hobart and Chandler returned to Sea Dragon, attacking approaches to the Phu Lap highway bridge near Vinh and then proceeded south to attack WBLCs in the Cua Khau a few miles east of Ki-Anh. On August 1, Hobart was relieved by USS Rupertus (DD 851) in Task Unit 77.1.1 and went north to join the heavy cruiser St Paul. St Paul and Hobart patrolled in the Bay of Brandon attacking WBLCs in the Song Hau River north west of Cap Falaise. Hobart destroyed one WBLC with a direct hit and damaged five others. The coastal region from Cap Falaise north to the Red River Delta is again dune-fringed, but in contrast to the plain south of Cap Falaise a number of rocky headlands and offshore islands give variety to the coast. Large mangrove swamps and mud banks lie on the edge of the Red River Delta and run out to seaward for some miles. Much of the coastal plain is less than three feet above sea level and the principal river of the region, the Song Ma, is bordered with embankments along its lower course. Strengthened by the addition of the destroyer USS Blue (DD 744), the task unit attacked the Cong Phu railway spur inland from Cap Bang on August 2, quickly provoking enemy coastal batteries into opening fire. Heavy shore fire repeatedly straddled St Paul which received rounds, while Hobart and Blue received rounds each. The nearest rounds to Hobart fell about 100 yardHobart withdrew under smoke delivering forty-four rounds of counter battery fire onto the offending coast defence sites. Three days later, the ships fired on the Hat Tun boat yard near Thanh Hoa with a Seventh Fleet aircraft directing the fire. The combined fire of St Paul and Hobart damaged or destroyed fourteen of the twenty boats in the yard and began extensive fires. St Paul was relieved by the heavy cruiser Boston on August 8, and on the 9th Boston and Hobart were fired on while making a high speed sweep from Cap Chao to the Song Yen near Chau Khe. Boston was the main target for the shore batteries and some rounds fell within fifty yards of the ship. The closest round to Hobart splashed into the sea 500 yards off the port quarter. This was only the second occasion in Sea Dragon operations in which a task unit had been attacked before opening fire on a shore target; the 1st on April 22 when Hobart and USS Collett fired on in the same area. The enemy made a concentrated effort on the night of August 11 to catch the task unit whilst engaged on a WBLC sweep from the Son Yen River to Hon Me Island. The ships USS Porterfield (DD 682) had replaced Blue on August 10 and tracked by radar and subjected to the fire of at least six batteries. The closest rounds fell fifty yards of Boston and 150 yards of Hobart was the first evidence of a concentrated effort to take a task unit under fire at night. Hobart's most rewarding attack on occurred on August 13. Directed by a spotter craft, Boston and Hobart engaged a large group of WBLCs south of the Bay of Brandon. Boston sank seventeen and damaged thirteen while Hobart destroyed thirteen and damaged twelve. Early on the 16th, the task unit fired on Tien Dien and Phu Lap highway bridges near Vinh before Hobart was relieved by USS I Stoddert. As Hobart left the task unit con her final Sea Dragon assignment, the Australian flag was honoured by USS Boston with a twenty one gun salute. After a maintenance period in Subic Bay and recreation in Hong Kong, Hobart returned Vietnam on September 6 joining USS I (DD 941) in providing naval gunfire support for the 12th Battalion, 3rd Marine Division, from the Cua Viet to the DMZ. Her fire was directed by a spotter in a tower near the fortified village of Gio Linh, four miles south of the DMZ. Targets of Hobart's fire during her last days in Vietnam waters included North Vietnamese troops caught in the open, storage areas, artillery positions and troop-carrying sampans. Hobart fired her last rounds in an H & I mission in the early hours of September 12 and left for Subic Bay the same day. 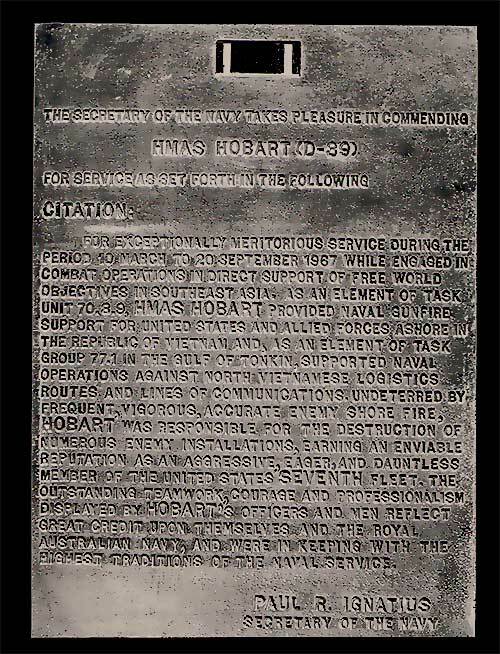 At Subic Bay on September 14, Captain P. H. Doyle of HMAS Perth took 'The Weight' from Captain Griffiths in a ceremony that marked the end of Hobart's combat tour. The first ship to wear the Australian White Ensign on active service, Hobart returned to Sydney on 27 September 1967 having steamed 52,529 miles in her first deployment. Hobart fired 9204 rounds at 1050 targets and came under enemy fire on nine occasions. For her service in Vietnam, Hobart was awarded the US Navy Unit Commendation which was presented to her ship's company in Sydney on April 21, 1969 by Vice Admiral W. Baumberger USN, who deputised for Admiral J. J. Hyland USN, the Commander Seventh Fleet during Hobart's attachment.